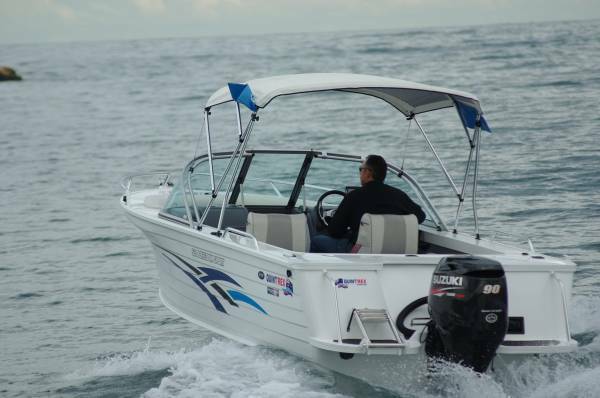 Freedom Sport is the name Quintrex gives to bow riders, perhaps their most popular type. The review 510 Freedom Sport is modestly named, as its hull length is 5.33m. It could almost be considered a convertible runabout as the forward cockpit has a cover. 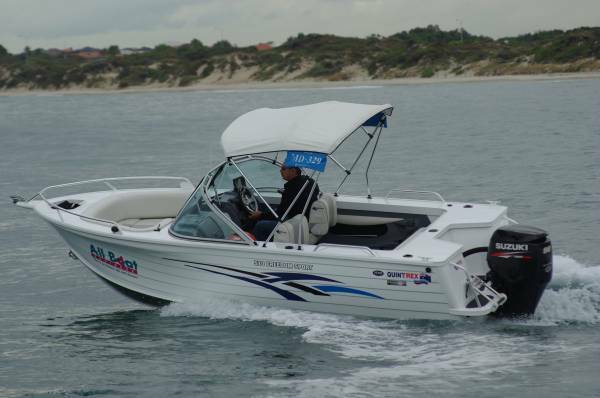 You might leave it in place for a choppy crossing to Rottnest, then open up for the sheltered waters. And, unlike many of the imported bow riders, this one is designed and equipped to be on the open sea. Among other items it has a bowsprit, cleat and cable-well for the anchor, gear conspicuously absent on virtually all imports in this style. We are a long way past the millennium, but Quintrex’s Millennium hull still sets the standard in pressed aluminium. Adding to the flared bow above the chine that has been a Quintrex feature for decades, the builder put concavity into the forefoot to soften the contact with waves. We had a modest chop on the ocean that the hull mastered with ease, but to test it a bit more harshly we set the trim up badly. Trimmed well out we used that 90hp directly into the sea with the predictable result of a bow wedged up well clear of the water and then dropping again. A big rise and fall but no slamming; the ride remained acceptable. 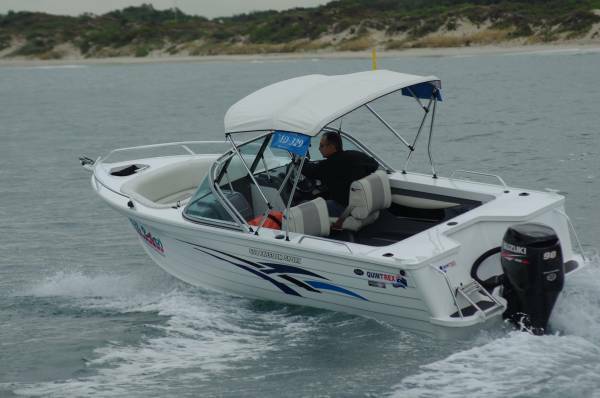 Recommended power ranges from 60 to 100hp, and this is such an easily driven boat that the minimum size would do an effective job. 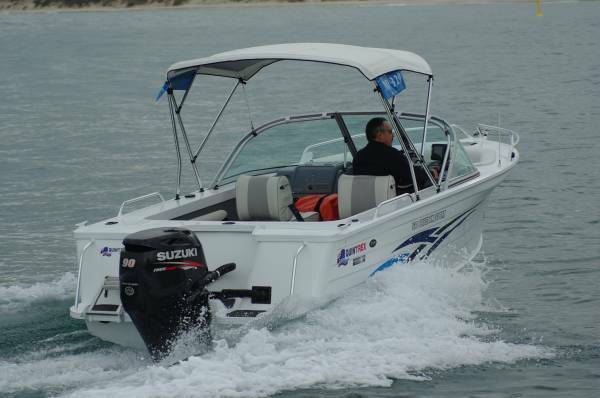 The review boat had a 90hp Suzuki four-stroke on the transom that was kick-in-the-back; put half a dozen people on the boat and it would still have a skier up in quick time. Our 510 had level flotation that requires the buoyant material to be carried up the boat’s sides. A good safety feature, and done better than on earlier Quintrexes: side pockets have been let into the material, and these have been enhanced with a pair of rod racks on each side. The interior generally has an up market feel with full carpeting, almost complete lining, and particularly comfortable seats. There are plenty of those: a pair of reversible singles at the consoles, a folding four-seater aft, and room for three in the bow cockpit. No boat ever had enough storage space but this one must come close. Besides the pockets it has an extra-large glove box, two under deck floodable compartments (one big enough for skis or a wake board) and bins under the bow seats. Possibly counting as storage are the abundant drink holders. 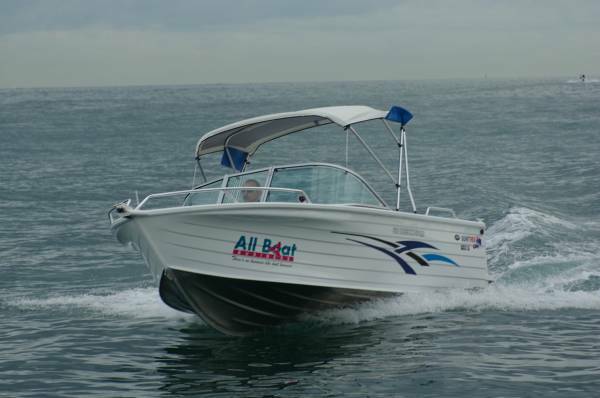 Standard equipment includes compass, VHF marine radio, navigation lights and a sounder. The extra we had fitted was an extended Bimini, still throwing enough shade with the seats reversed. These low seats put your feet flat on the deck, which is great for sitting but means no headroom under the Bimini when standing. However leaning forward puts you ahead of it, and there is a perimeter rail on the windscreen to hang on to. Quintrex worked out the ergonomics long ago and everything falls neatly to hand and eye. The gear-throttle control was not fitted as an afterthought, the wheel is well placed relative to the seat, and the neat dash display is easily read. Analogue gauges report speed, revs, trim, and fuel remaining in the 95L tank. Bow riders tend to get pigeon holed as river cruising-casual ski boats, and certainly skiing is a role Quintrex envisioned - they provide a ski pole socket - but this one is much closer to the genuine all-rounder; fishing is a definite starter. Both cockpits offer good ocean access to anglers, and the stability is well up to clustering on one side. In the day cruising role the thoroughly seaworthy hull with reassuring freeboard means the stamping ground is not confined to sheltered waters. Quintrexes are not the cheapest of boats, but they are among the easiest to resell and possibly retain more value than any other trailer boat. 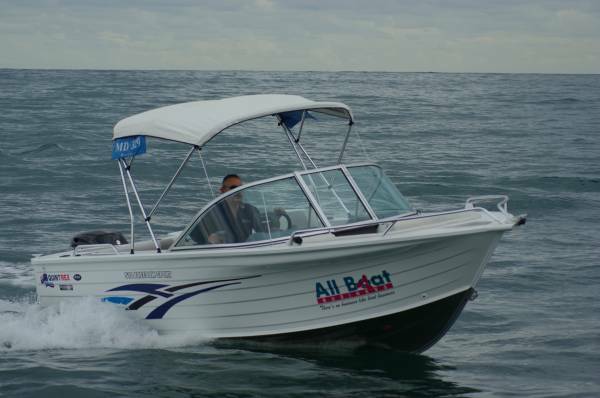 Not a reason on its own to buy, but it sits nicely with this capable and versatile boat.